When the 2015 Ferris Wheel was announced back in April, the internet went nuts for it. 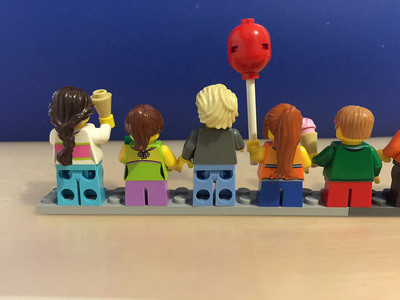 Since the release of 10244: Fairground Mixer, fans around the world were screaming for a set to go with it – something to make their fun fairs bigger and better. 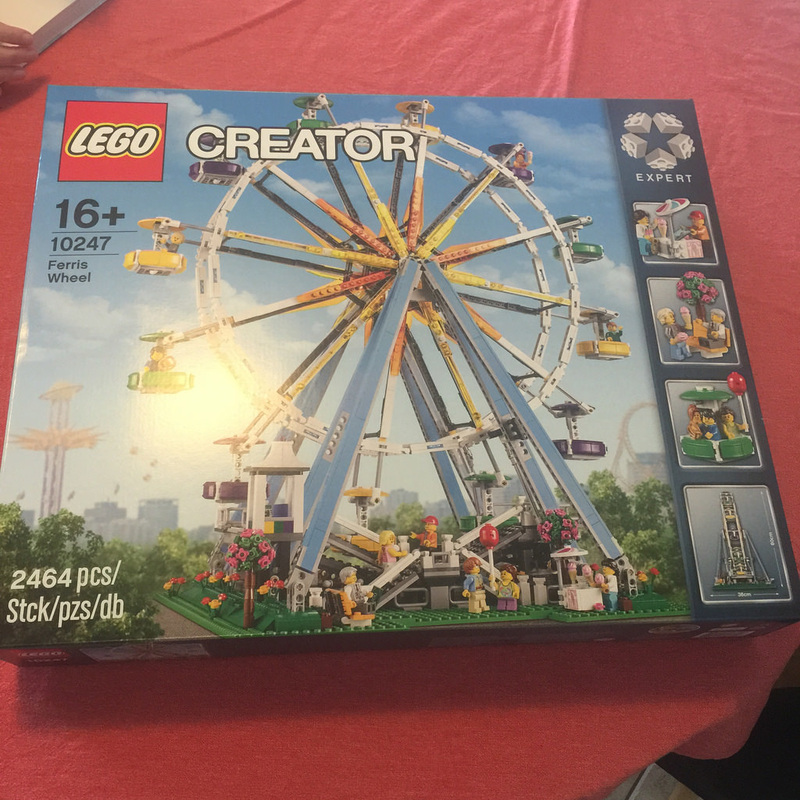 Well, LEGO responded with the 60cm tall Ferris Wheel, and it is an absolute beauty! 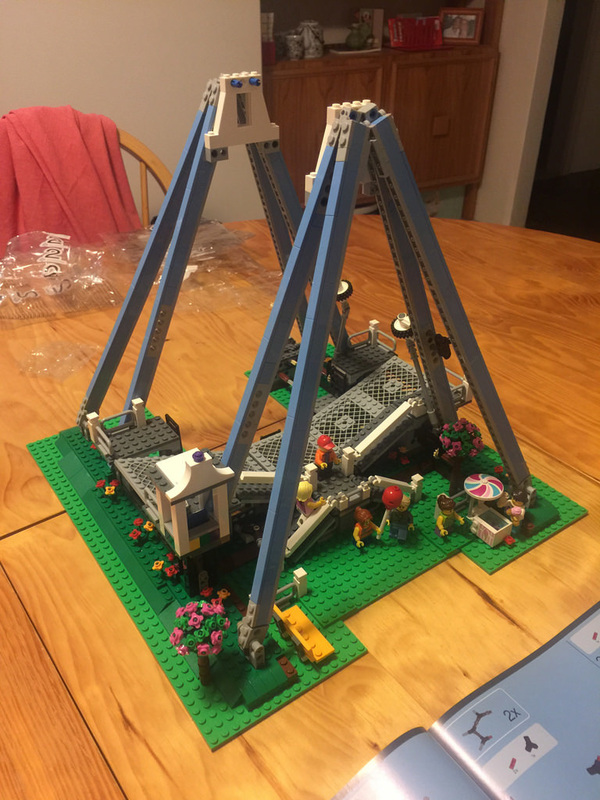 This isn’t the first time LEGO has released a Ferris Wheel. 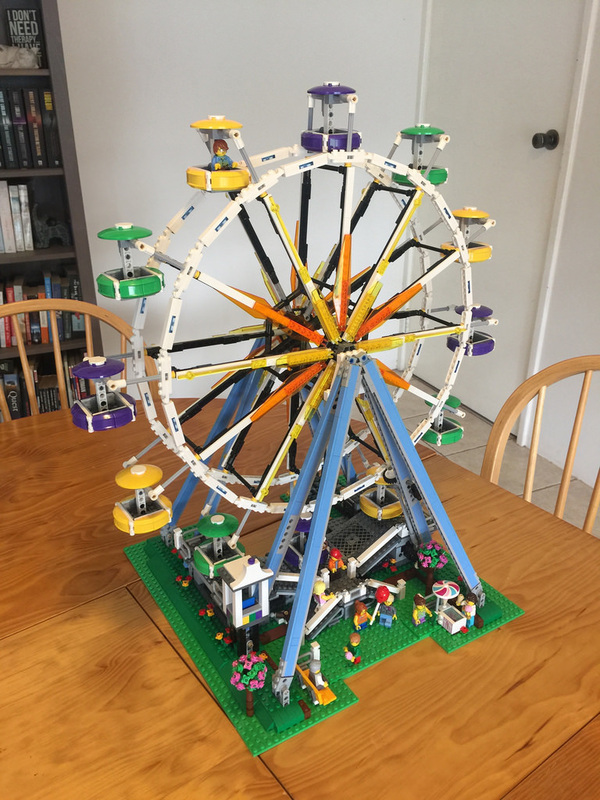 Back in 2007, 4957: Ferris Wheel hit the shelves, but it was nowhere near as pretty as this one. The old one was pretty dull to look at, and while it did spin, sometimes it got stuck for some strange reason. This one, however, is a different story. It’s colourful, has plenty to look at, and has loads of fun little features. So, out of the box, you will get 22 bags of parts, a separate bag of plates, and a very nicely bound instruction book. There’s a lot of parts in this set, so they are separated up into four stages. I’ll be looking at the build in those four separate stages too, to make things a little easier! One more added bonus with this set is no sticker sheet! Brilliant. In this set, there are plenty of existing parts in new colours, but there are a few new parts, the 1x3x2 inverted curve in white (used to make the shape of the control box roof), as well as a good amount of the six-branch flower stems. These appeared in a few Elves sets, but they come to good use here in the new cherry blossom trees. The grid 8×8 plates are new in medium stone grey, and you get five of them, which is pretty generous. There is a very big list of items in new colours in this set, so I won’t go through them all, but it’s exciting to go through the parts and get excited as you build. 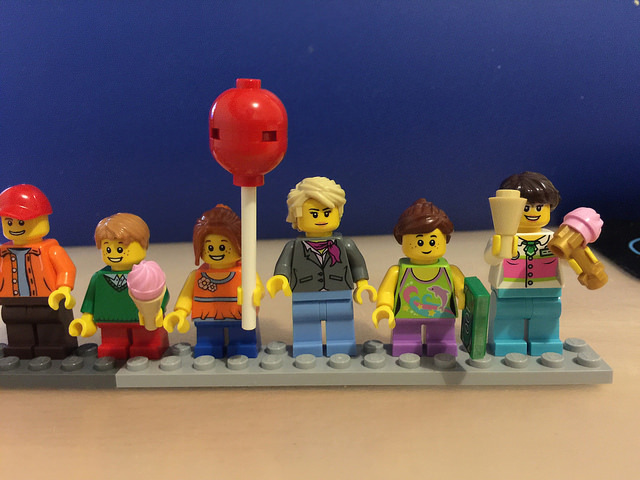 As far as minifigures go, you get 10 of them, six adults and four children. 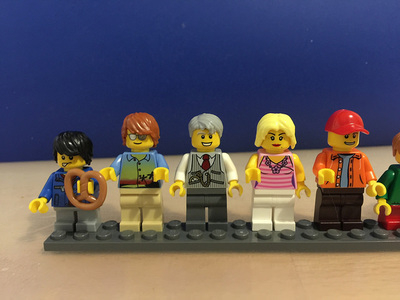 The minifigures themselves are pretty nice, with a nice mixture of male and female, some with accessories – a pretzel, some cash, a brick-built balloon, and an icecream cone and very clever icecream scoop. While you don’t buy the creator sets for minifigures, they add a great level of detail and realism. 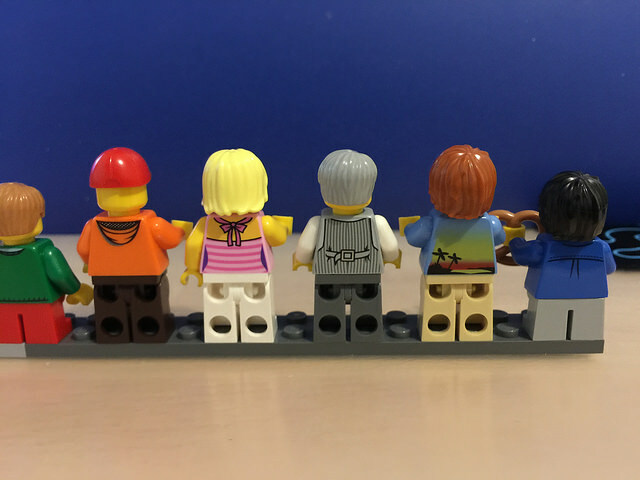 Nine of the minifigures also have back printing. Stage one of the build is the base. 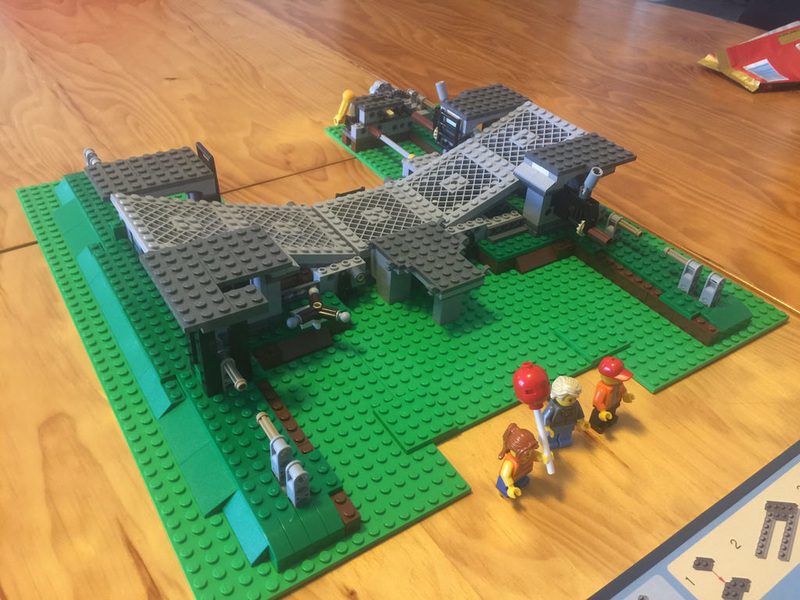 It’s interesting to note that while this build would fit perfectly on a 48×48 baseplate, LEGO has decided to create it using five 16×16 and two 8×16 bright green plates instead. I’m not sure why, but maybe they have plans for other sets later down the track – who knows. The base of the wheel is mainly Technic framework, with other green plates and slopes to cover. Next, a Technic mechanism is added to raise and lower the loading platforms (the 8×8 grid plates). Once that’s installed, the grids go on, as well as the start of some walking platforms. A yellow lever at the back raises and lowers the platforms. I was very surprised later down the track that LEGO admits the grids may rub against the walking platforms, and tells the builder to attempt to move them out of the way. I noticed this also when installing them. I found that once the struts for the wheel were installed, you could move them out of the way and the problem would be fixed. 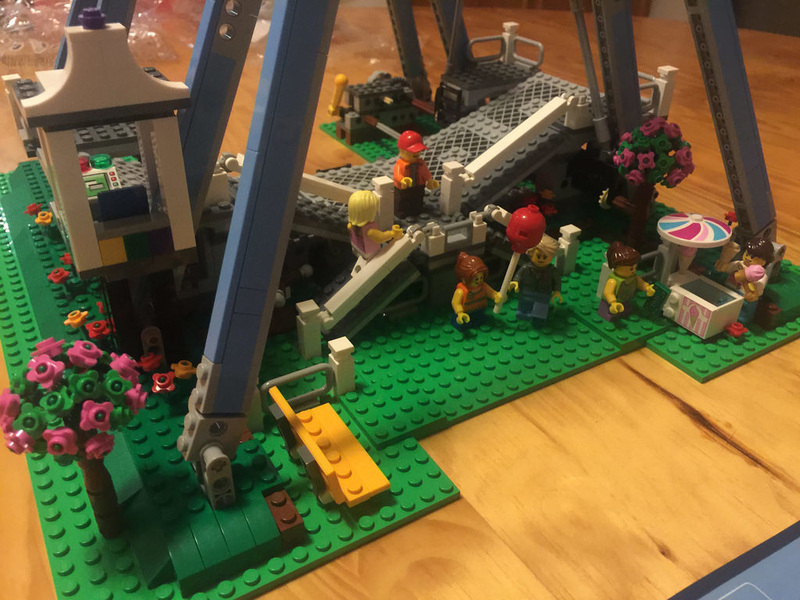 Stage two got you started on the walkways, decorating the platforms, building the control box, and the icecream seller’s stand. Once that was out of the way, the A-frame struts were installed, as well as the wheels that turn the ferris wheel. As soon as you install the struts, you start to realise just how tall 60cm is. It’s massive! The cherry blossom trees are also built, to add some nice colour to the set. These look great, with closely packed flowers around a stem. Stage 3 was the beginning of the wheel. This bit is very repetitive. 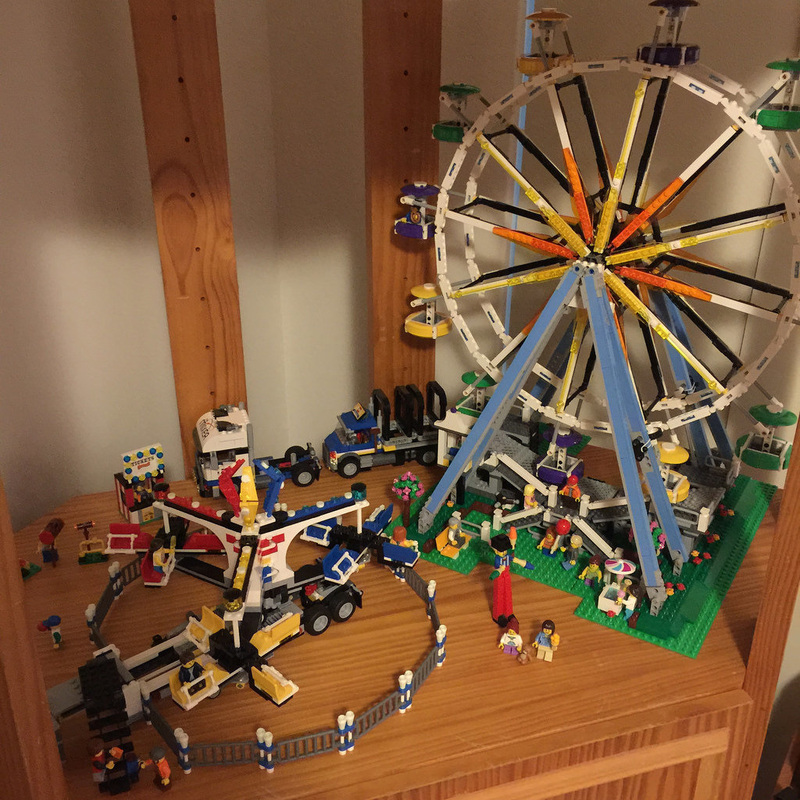 I only built half the wheel, with my wife building the other half, and even that got a little tedious! Everything is identical, from the centre hubs, to the spokes, and the rim sections. You end up building things on repeat. Once done however, it looks brilliant! It’s quite strong too. And when it’s fitted to the rest, well, it’s massive. Finally, the 12 gondolas are built. This is again, very repetitive. Building each section of door and walls for the gondola had to be done over and over again, but it’s worth it. When it’s fitted, it looks spectacular. One thing I did notice that most wouldn’t until the gondolas are on, is that some of them rub on the grid plates. This was because the white Technic elements that connect the gondolas to the spokes, (and the spokes themselves) may not have been pushed together as closely as they should. A quick readjust, add the rubber bands to the drive wheels, and we are ready to roll – well, spin! It’s pretty great that they have kept with the traditional method of moving a ferris wheel – the tyres on the rim. It’s incredibly clever, and doesn’t mean a motor in the centre of the hub. Adding a battery box (I had the Technic one – it doesn’t fit as nicely as the other) and PF motor makes for a brilliant hands-off display. They aren’t included, but are worth getting. All in all, it’s a brilliant set – one that takes pride of place on my display shelves. There’s so much to look at! Loads of minifigures that make it come alive, some serious design and though has gone into this. Everyone that has seen it is amazed that it is made from LEGO. They didn’t realise it was so versatile! It’s also huge – much bigger than I originally thought, and it looks great next to the Mixer. Both adults and kids faces just light up when they see it. 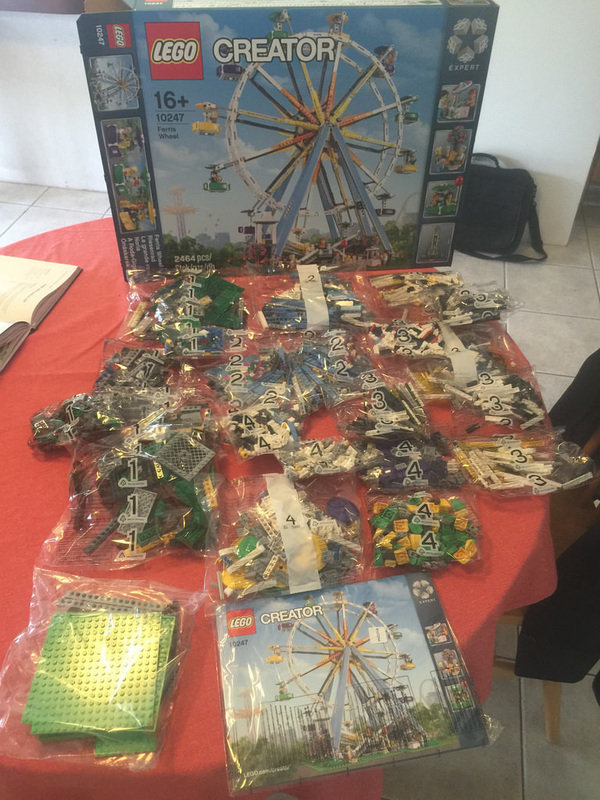 If I had 10196: Grand Carousel, it would look like a really vibrant display! There’s good colours – a few people have commented that it’s not as bright as it could be, and they are somewhat right, but I like the subtlety of it. It’s also quite strong. I moved it around a bit, and nothing has fallen off or moved. I couldn’t really find many negatives with this one, aside from the rubbing parts that I’ve already mentioned (and fixed). It would have been great to get some glowing parts like on the Mixer, but I have a few spare, so I’ll add them on. I would have preferred a 48×48 baseplate, but that’s a very small negative. It’s a very repetitive build, but with so much symmetry, it is a necessary evil. 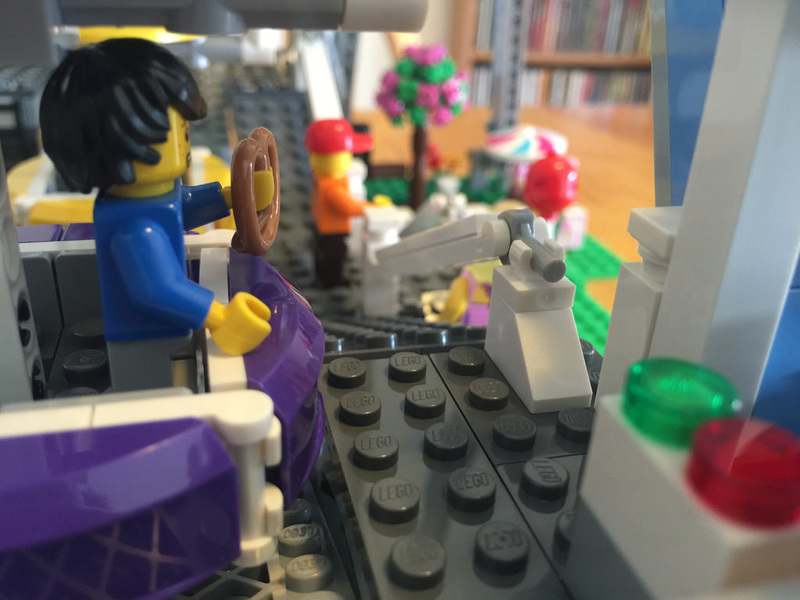 Also, with so many gondolas, it would have been nice to have a few more minifigures to ride the ferris wheel. All in all, this set gets 8.5 out of 10 gondolas. Next up on the review list is 40182: Bricktober Fire Station. It’s a special one that came out as special Toys-R-Us purchase bonuses. There’s four of them, but I only have the one for now. Have you got any thoughts on this set? Leave a comment! 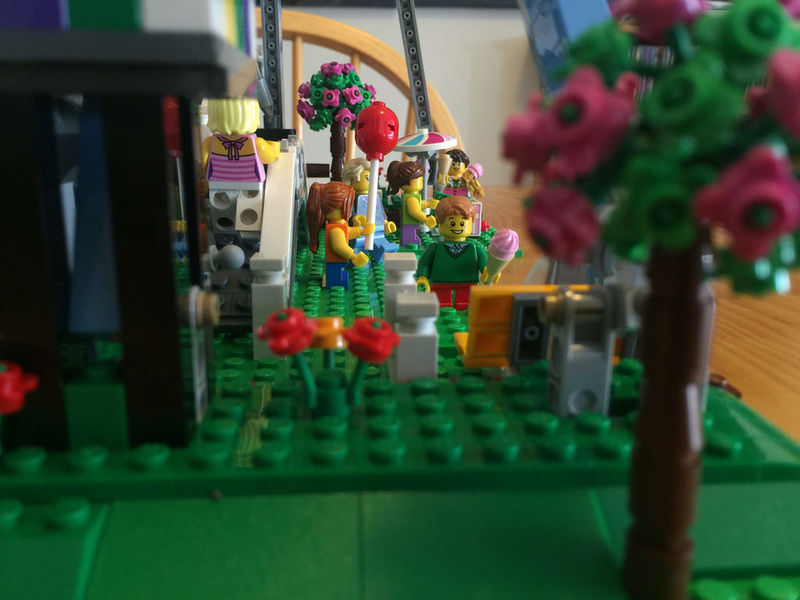 Also, don’t forget to like and share the posts from the BricktasticBlog page on Facebook.